The Lodge was formed under the English Constitution in response to the strong desire on the part of Brethren of the West Indian community of Masons in the UK to enhance fraternal ties among themselves, as well as, Brethren from the West Indies and elsewhere. Research following several meetings of the committed Brethren, showed that there was a significant quantum of interest to establish an identifiable West Indian spirit, and that there was enormous support and potential from the community. 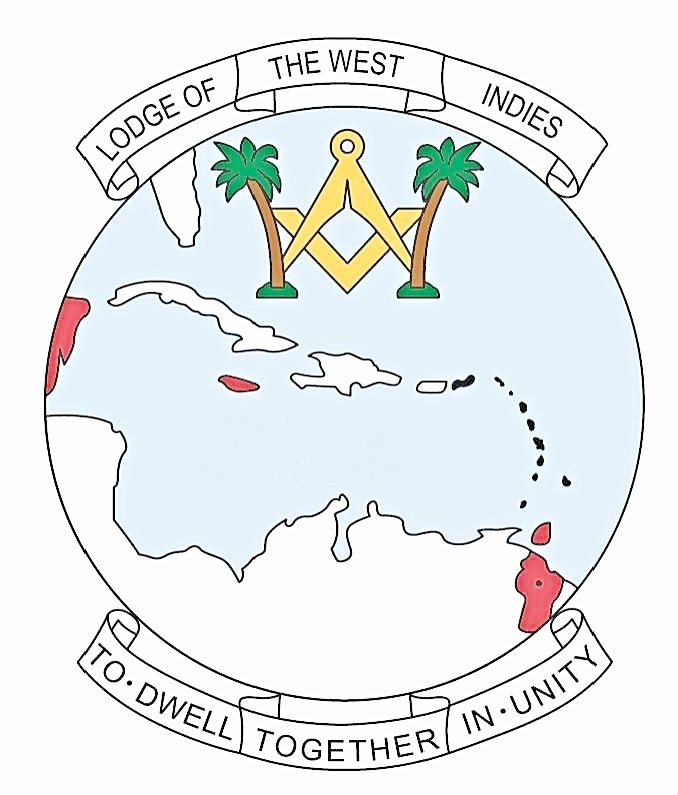 The formation of the Lodge of the West Indies exemplifies the marvellous way in which masonry can work as the embers began by the chance meeting of two masons from the Caribbean living in the UK at the airport. They were heading to Jamaica and after a small discussion identified themselves as masons. Subsequent discussions led to the forming of a Steering Committee. To obtain a warrant, the first step of which is to obtain a sponsoring Lodge as stated in the Book of Constitution, Rules 94-103, together with guidelines from Freemasons Hall dated July 1972. Caribbean Lodge No.4826 was suggested. Before the warrant is issued the petition should be read out in open Lodge at the quarterly meeting of the United Grand Lodge of England. Arranging and carrying out the Consecration; this ultimately depended on the availability of the consecrating officers of the Grand Lodge of England. Meeting and dining facilities were looked at with costs. The decision to choose a Temple depended on factors including meeting day, availability at that temple on the day and the cost for rental. It was agreed to have four meetings a year with the Temple and Festive Board deliberations held in the same building. The Ritual was unanimous on the adoption of Emulation Ritual. The Floor Workings were deferred for further discussion. There was a lengthy discussion on the proposed dates of the Meetings with the main argument around Saturdays as the meeting date. The summons had several styles discussed. Finances: it was generally agreed that the subscriptions per annum be inclusive of dining fees. Hon. Chairman, Hon. Secretary and Coordinator. There was a vote of 6 to 5 in favour of holding the meetings on Saturdays after a West Indian style discussion. The design of the logo then began to take shape at this meeting. It was agreed to have four meetings a year with start time around 4:00pm. It was agreed to approach Caribbean Lodge No.4826 to be the sponsoring Lodge. The Consecration date was set for Wednesday, 26th June 1991 as many West Indians would be visiting as the cricket team were touring then. There is a minimum requirement of seven Founding Members with no upper limit. Any Brother who has been a Master Mason for at least Three Years and is prepared to actively assist in the conduct of the proposed Lodge. The question was raised “whether a Brother who is a Master Mason of the Scottish Constitution for more than three years and is a member of a Rose Croix Lodge of the English Constitution can become a Founder Member of a Craft in the English Constitution”? The answer was “Yes, provided the brother read a Declaration at the Consecration meeting”. At the Steering Committee meeting on April 20, 1991 the details for the Consecration were finalised including 102 petitioners and 122 joining members. Lodge of the West Indies No.9424 was Consecrated on Wednesday, 26th June 1991. It should be noted that two founding members have achieved the milestone of attending one hundred (100) meetings and are still not out. This is quite a remarkable achievement. May the trend they have set continue and be a shining light for the newer members of the Lodge.